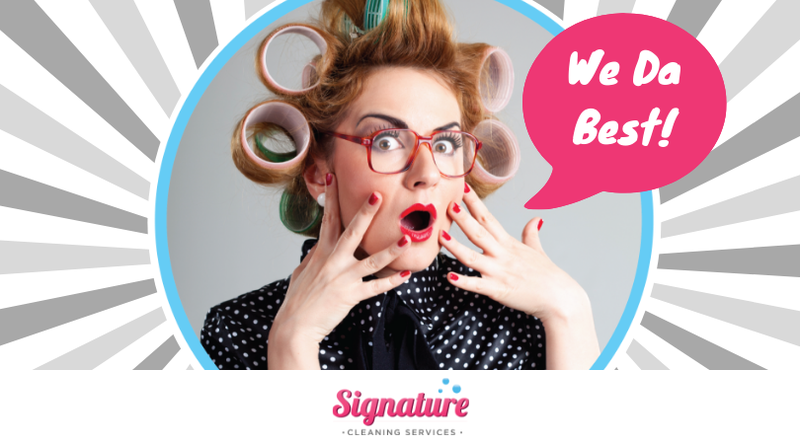 What is a typical day like for a house cleaner at Signature Cleaning Services? We get asked this A LOT. The professional home cleaning industry has many different operation models. At Signature Cleaning Services, we have carefully selected the way we operate based on our Company Core Values and the type of Company Culture we strive to foster. This is what a typical day looks like for a house cleaner at Signature Cleaning Services and how it relates to our very simple compensation model. All Team members report to our office at 215 Oakland Avenue for 8:15 AM. It looks like a house from the front, but inside it’s a beautiful pink office space we like to call our “Employee Hub”. If you want to arrive early: The coffee is on: Bring a Mug. Got a favorite creamer? Bring it to share. Chat. Share. Connect. There is a lot of laughter here in the morning. It’s a busy place! At 8:15 AM, you’ll punch in with your finger on our super techie biometric punch clock. Sometimes it’s stubborn, but if you jump up and down three times, click your heels and say “There’s no place like Signature” it will usually connect. You are now Punched in and on the Clock. This is what we call “Punch In” on our hiring ads. Some companies have a punch in time when you arrive to the first job. Our goal is for employees to be able to separate their home time and their work time. You think about work when you get to work. You do not wash cloths at home, you never have to load and unload your equipment at home or when you are not punched in. Running a household is work enough. Save that time and energy for your family. In the Office you will connect with partner with a High Five, and pick up your Team Ipad. All your jobs for the day are electronically dispatched for you. Most of them will not be a surprise. Our goal is to build out a stable schedule for your team. You will see all the jobs, read all the notes and be able to ask any questions. You never have to print Work orders from home or download them onto your phone. Next, you assemble your Team Kit which includes everything your team needs to complete the work for the day. It is in it’s assigned spot and where you placed it yesterday. You will be given clean microfiber cloths for the day based on the number of jobs assigned. You will then load this kit into the Pink Signature Car assigned to your team. It’s already filled with gas, and if it’s -25 degrees out, it is likely already running for you. On Mondays we drive through the gas station to fill up. You do not need to get out of the car. It’s like a Formula One race! One of our managers is inside paying. Lots of people take pictures because it’s pretty cool to see. 🙂 It would be AWESOME if we had Pink Flags. We’re working on that piece. This is all paid time. At Signature Cleaning: all time is treated equally. You are not paid a separate rate for morning load, travel, or job time. It is simply paid all the same. And ALL that time is paid. You will route yourself to the first job using the mapping program attached to the assigned job on your Team Ipad. You never have to use your own phone or data plan for work. Your Team Ipad has everything you need to find your way and route yourself effectively. You will as a Team ROCK OUT your first house, high five your partner at the end, throw in a couple laughs probably at the expense of your partner, then either take your 30 minute lunch or drive to the next job. We allow a reasonable amount of time to deliver an excellent clean in our customers’ homes. We set reasonable expectations. We have a “BAT PHONE” in the office for our techs in the field. It ALWAYS gets answered first. We support our teams in the field. We will come out to a job if something is off or not right. At the end of your assigned jobs for the day, you will route yourself back to the office, park your PINK CAR in the lot, and unload your equipment. You will refill supplies, and/or request new equipment. The Company pays for all of this. You will hang up your vacuum that you’ve probably nicknamed R2 or Betty or some other name you came up with in your travels. Then you will finish completing your timesheet, have any conversations that need to be had, (all paid time) then punch out. This is the “Punch Out” we speak of in our hiring ads. The only unpaid time in your day is the 30 minute lunch. All time is paid at the same rate. We do not believe in payroll voodoo, or sliding scales. We do however have bonuses. That’s a whole other topic though. This is pretty much what a typical day looks like for a House Cleaner at Signature Cleaning Services. Transparent Pay, Teamwork and Fun. If you want to work with us: WE ARE HIRING! Click the button below, fill out the application form and we will respond in record time!